It’s that time of year again for the family reunions, hosted parties, and other festivities that make your holiday season special. But that also means that it’s time for another season of increased chaos as you prepare food, events, gifts, or travel plans. Merriment and madness seem to go hand-in-hand during the holidays, and we want to help ease the stress so that you can focus more on what really matters. In this blog, we’ll explore four smart home automation upgrades you need for a more peaceful and smoother holiday season in Cheyenne and the surrounding Wyoming area. Just keep reading to learn more. Home security is at the forefront of every homeowner’s mind during the holidays, especially if you’re planning a long vacation or leaving to visit extended family. Feel safer this season with an automated security system that integrates your indoor and outdoor lights, locks, surveillance cameras, and even your HVAC system. From the simple touch of your smartphone, you can control and monitor your home from anywhere in the world. Schedule lights to turn on at night to simulate occupancy. Can’t remember if you locked your backdoor? Not a problem. With integrated smart locks, you can lock any door in your home from your smartphone. If you already have a smart home, then integrating your devices with voice control is the next upgrade you need for an even easier holiday this season. Imagine coming home in the evening after a full day of shopping, hands full of groceries and gifts. How do you reach your smartphone or your home’s keypad to turn on your lights? With a voice control assistant like Amazon Alexa, you can simply say a command, and your lights would turn on to the exact pre-setting you ask for. Want to set the holiday mood? Just ask Alexa to play your favorite seasonal playlist and turn up the heat in your home. Without having moved a finger, your house is now immediately warm and welcoming after a full day of running errands. You already have a lot on your to-do list when you’re preparing your home for guests and holiday parties. With automated lighting control, you can take one more thing off your list. Occupancy and vacancy sensors ensure that lights in any room of your home will only stay on when they need to. You can also integrate your lights to dim or turn off when natural light floods into your home and then turn back on in the evening as natural light disappears with the sun. During the holiday season, set automated schedules for your festive home décor to light up just in time for family events and parties so your home looks its best as guests arrive. Spending time with loved ones is a big part of what makes the holidays so special. AV distribution can be a big help in setting the scene for quality time with family and friends. From your smartphone or tablet, choose a festive playlist to stream through your whole-home audio system and bring holiday cheer to every area of your house in a snap. Instantly stream the holiday movie your kids are watching in the media room to your television screens outside while you roast marshmallows by the fire. In just a touch, control all your audio and video from your smartphone with an integrated app. 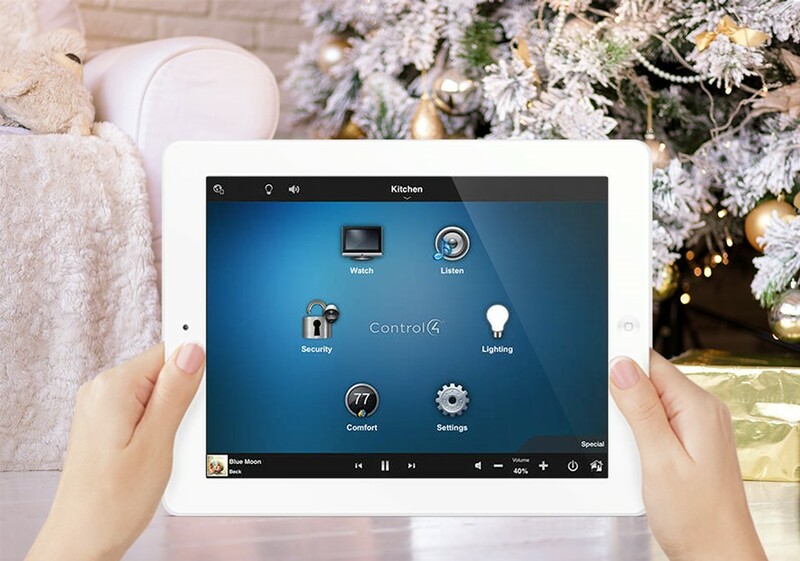 Let us help make your holiday easier this season with a smart home automation upgrade. Contact us here or send a chat below to start talking with a professional smart home integrator in the Cheyenne, WY area today.